AKC Miniature Dachshund Chocolate & Tan Piebald male puppies born March . Three Tuxedo Pies for $500 each and two Extreme Pies with white on faces for $600 each. 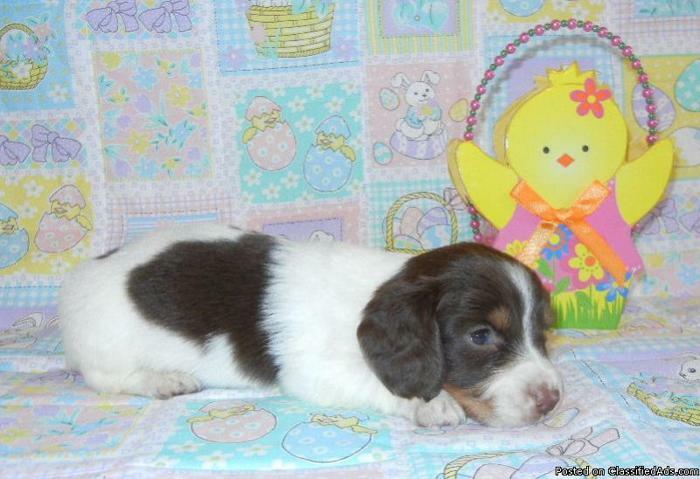 Mother is a longhair Chocolate & Tan Piebald and father is a longhair Chocolate Dapple Piebald. Both parents can be seen on website along with their pedigrees. Payment plans are offered and shipping is available for an extra $300. If picked up, puppy will come with a large ?Puppy Starter Gift Bag? with lots of goodies inside, which makes a nice gift. Please visit our website at www.cynthiadoxies.com or send an email to cynthiadoxies@yahoo.com or call (850) 233- for additional information.